Major UK retailers plan to stop adding harmful trans-fats to their own-brand products by the end of the year. The move was announced by British Retail Consortium members Asda, Boots, Co-op, Iceland, Marks and Spencer, Sainsbury's, Tesco and Waitrose. It is hoped the move could help cut rates of heart disease and obesity. Cholesterol-raising trans-fats, in the form of hydrogenated oils, are often added to bakery and dairy products to extend shelf-life and improve texture. They are also used by the fast-food industry. But they have no nutritional value, and like saturated fats, they raise blood cholesterol levels which increase the risk of coronary heart disease. Health authorities around the world have recommended their consumption be slashed. A BRC spokesman said about 5,000 own-brand products would be affected by the decision. He said it took time to remove the fats, as retailers had to ensure their products remained appealing to consumers in their re-formulated form. Several leading retailers have already committed to reducing trans-fat levels, but the latest announcement represents a marked acceleration of the process. Andrew Opie, BRC food policy director, said the decision by its leading members showed that they were prepared to act to achieve major change much faster than any legislation could do. He said: "This is the latest in a string of healthy food initiatives and shows that BRC members, responding to customer concerns, are willingly delivering a scale and pace of change way beyond anything retailers or manufacturers are doing anywhere else in Europe." 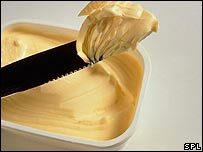 Alex Callaghan, of the British Heart Foundation, said: "It's good to see companies making moves towards reducing and removing trans-fats from their own-brand products. "Currently, it isn't easy for shoppers to know how much trans-fats are in the food they eat, and it can be confusing. "The BHF calls for manufacturers and retailers to work towards elimination of trans-fats from products. "In the meantime, trans-fats should be clearly labelled food packaging so that people can make informed decisions about their diet." In Denmark, trans-fats in the form of partially hydrogenated oils were effectively banned four years ago. The European Union is encouraging retailers to reduce or stop adding trans-fats. However, it is also taking action against the Danish authorities, on the grounds that their ban is a block on free trade with other member states.